Greetings friends and fellow crafters. LeeAnn here with a couple projects I made for White Rose Crafts using Nuvo Drops through a stencil and some great projects that make great add ons with the December Card Kit. This cute little tag was made using Lawn Fawn's Winter Skies stamp set. I used Nuvo "Sea Breeze" Jewel Drops through a Heffy Doodle Snow Drift stencil. The images and sentiment are stamped using Memento Tuxedo Black ink. My background is using Broken China Distress Oxide and the scarf is colored with Chameleon Crimson Red marker. This card was made using Wild Rose Studio paper (Festive Florals) as the background with the same Heffy Doodle stencil and Nuvo Sea Breeze Jewel Drops. 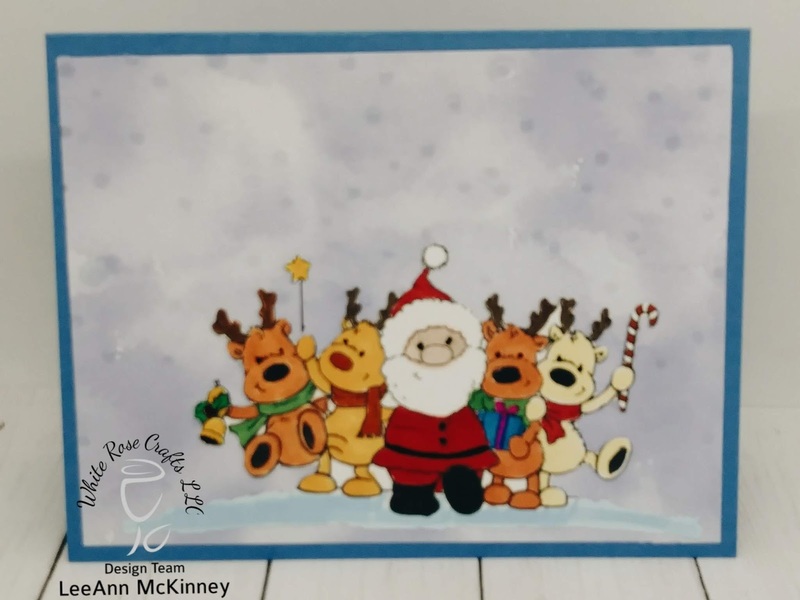 The image (Jolly Reindeer) is stamped using Memento Tuxedo Black Ink and colored with Chameleon Markers in various colors. I then used my Brother Scan N Cut to cut out the image. Using Nuvo Deluxe Adhesive I attached the image to the base.